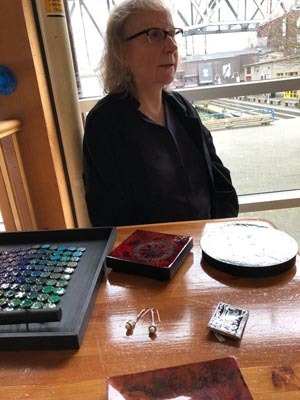 Peggy Logan is a jeweller, an enamel artist, a jewelry instructor at Soigne in Vancouver and Mountain Gem in Burnaby and also a painter who recently graduated from Emily Carr. 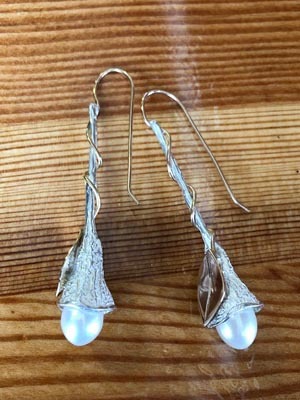 Her jewelry pieces are finely crafted with delicate references to nature often incorporating silver and gold in one piece. Her beautiful cloisonné brooch called "Light in the Forest" was inspired from a misty walk in the forest by the sea on the China Beach trail near Sooke. To make this kind of piece she places very thin flat gold or silver arranged wires in the shapes she wants, then layers in coloured enamels and fires it to melt the enamel. She repeats this process layer by layer until the enamel comes up to the wire, then of course there is the finishing, hours of careful crafting. She also makes larger copper enamel wall pieces. She has created a fantastic piece made from many old Canadian pennies enamelled in many colours all ringed together to make one piece, a waterfall of colour. You can see the date on some of them. Her larger enamelled pieces are discs of abstract extravaganza colour. Look closely and you’ll see the cosmic detail. Peggy’s paintings are mostly abstract but she is skilled in realism as well. Her enamel work influences her painting and her painting influences her enamel work. She is inspired by natural scenes and the Japanese creatively dot obsessed artist, Yayoi Kusama, for the abstract. Peggy says painting dots is very compelling and I imagine very meditative too as one can see in her Dot painting. "Light in the Forest" cloisonné brooch enamelled Canadian Penny wall hanging Large dot painting 49" x 51"